Amazon is now allowing third-party sellers to add photographs showing their used and collectible items in the Offer Listing page, providing shoppers with a more eBay-like experience. Most Amazon users are familiar with the marketplace's main product listing page pulled from its catalog, showing photos and detailed information about the product itself, and showing up to four sellers from which they can buy the item. The main product page also includes a link to the "Offer Listing page" showing however many listings of new and used listings are available from all sellers, which is more similar to an eBay search results page. Many sellers are pleased with the new policy that lets them upload their own photos showing their items in detail, but some sellers say this will either slow them down by having to add photos, or put them at a competitive disadvantage if they choose not to add photos but other sellers do so. Right now the policy is limited to certain electronics, music, office products computer and software categories. But one seller told EcommerceBytes that if Amazon adds the extra pictures to the Everything Else category, it will open a floodgate for sellers like herself. See tomorrow (Monday's) Newsflash newsletter for details, but in the meantime, let us know what you think of the policy. Will the new photo policy make listing used goods on Amazon more laborious - and will it succeed in attracting more buyers of used goods to Amazon? This is a great idea. It allows sellers to show better/more detail than the catalog photo offers. Plus, they can show any flaws on used goods, so the customers know exactly what they're getting rather than having to guess. A picture is worth a thousand words, after all. For sellers who take good photos, this a definitely a good thing. This is a sorely-needed feature for 'Collectible' (used) Toys on Amaozn, I think. Occasionally there is a significant discrepancy on what the customer is perceiving he/she gets versus what he/she actually receives, no matter how accurate the description written by the seller. Versus the more laborious eBay method of taking a year? to inflict new almost daily compliance changes of their photo policy? When you're Number One, more is a mere piling onto the competition. More bad news for JD. But I still would not sell my stuff on Amazon. Too dear and I don't trust them. 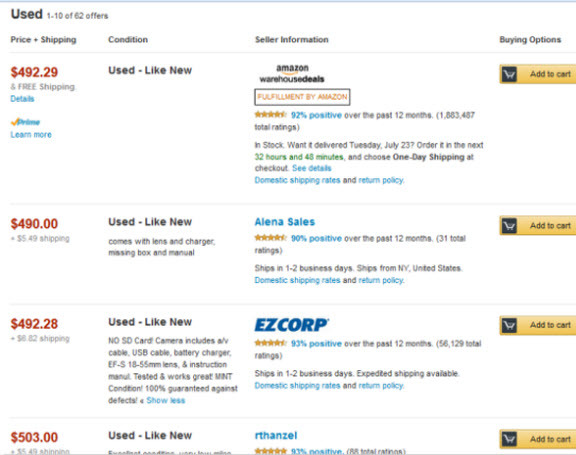 Did you know that Amazon doesn't allow used items in their Webstores? I wish they did. Now if they would expand their categories for used items I would be all over it. It is nice idea. I just hope they policy better the copyright photo issue than eBay. Is this a hint that Amazon will be getting into the collectables market more? That would be very interesting and I certainly would take notice and look into it. I used to sell on Amazon many, many years ago but basically dropped it when other sites started to allow photos as digital cameras became more prolific. This could be a big hit to eBay if it happens. I was looking into returning something I purchased on Amazon and was very SURPRISED to see a link asking me if I wanted to SELL THIS ITEM. I followed it and there were two categories of sellers--this might be old news to some but I have never seen this before--a "Business Seller" and a "Small Seller" ---it looks like there is a .99 FEE to list (or maybe if the item sells?) and a 15% fee on top of that. So this could be higher than ebay on some things. I then looked up somethings I commonly sell and noticed--you cannot seem to FIND any of them. Oh they had things of the same BRAND as I was looking for--but all NEW and spendy not used and much cheaper. Don't think they have a "Gently Used CLothing" section--altho they SHOULD. The allow you to sell used toys and books and other items--why NOT clothing etc? IF I thought for one SECOND that things would actually SELL on Amazon--I would be off of ebay in a shot. Watch closely----now that Amazon is courting collectibles sellers watch eBay do an about face on how they treat sellers of collectibles and their policies as it relates to collectibles. Had eBay been smart, they would have continue to do everything they could to market and grow collectibles. My guess is that now that Amazon has grabbed the ball and are running with it eBay will react. Too little too late eBay. Love this idea and kudos to Amazon for doing it. Just hope and pray that it works. Will need to see how it works - like where will the pictures be. Right next to your description or in with the main pictures?? They have to clean up the main picture area. Looked at a camera and it had pictures of flowers trees etc??? Amazon buyers are in a hurry, hope this method will force them to read the descriptions. Some look at the main picture and hit the buy button on the lowest price. Then they get upset if it's missing the detachable power cord. Of course the price the bought it at was 50% lower than the next cheapest price. I think this is a great idea and I will put it to use as soon as I can. This is going to give a definite advantage to a small seller who has the time to take a picture of his/her item and plop it up there. OTOH, Amazon can be picky about their catalog pictures. For instance, if you are approved to sell in the jewelry category, they are required to be against a white background. But of course those are for the main catalog pictures. Perhaps the individual item pictures will be less restrictive. I do hope they will expand this further than the "certain electronics, music, office products computer and software categories". I wonder why they did not offer it in books - seems like a no-brainer there. ... interesting to note the comments generated when Amazon makes a change vs when eBay makes a change. eBay makes a change = panic, stress, fear. Amazon makes a change = not such a big deal, and general acceptance overall. Be afraid, eBay, be very afraid. Speaking only for myself and the things I sell, this could be a sea change. 1. For eBay collectible sellers, all of the work has been already done, you've produced image(s), researched your item and decided on a price - so all that is needed is the 1-2 minutes or so of cutting & pasting to get a listing up on The River. 3. Shipping is determined by AMZN which usually does not correspond too well with reality, so there may be a little twist or two in that area. 4. It depends on how collectibles are organized and how much granularity is incorporated. Given AMZN's search engine, my guess would be that there wouldn't be as many sub-categories since the search engine is more responsive (but still weird sometimes) than eBay's "Casino". 5. Once listed, your item is there for a very,very,very long time unless sold, so you don't have to refresh your listings periodically. AMZN's manager allows modification in about 2 seconds of work instead of the 2 screen & scroll bollix of eBay's modify pages. 6. With collectibles, and I mean true OOAK (not collectible Chia Pets for instance), there should be less pressure for AMZN's famous "race to the bottom". I have put out books on AMZN which eventually sold at a premium whereas on eBay, where I had a duplicate listing, nada. 7. AMZN's 2 business day shipping can be constraining for some. 8. AMZN's business policies, while not as let say childish as eBay's, are not to be violated. From what I gather, don't mess with AMZN in that area. Their "justice" is just as swift and unforgiving as eBay. 9. Perhaps this plays into Ho-Ho's plan of letting the auction side slide into oblivion when OOAK sellers set up in AMZN. 10. Personally, if AMZN opens up collectible categories of my interest - I'll plant a flag there - why not. Just adjust the price accordingly. 11. I don't see FBA being too involved for sellers unless the collectibles are kinda standardized like Lenox birds, Hummel's etc where the seller wants to warehouse those items. Then again, if you are renting storage space, it may be an option. @Nan some of us look at it as not such a big deal, whilst anything Ho-Ho's minions dream up is usually an ill-conceived PITA. 12. Oh yes, you don't have to deal with TurboLister, and eBays crack programming staff who don't know the difference between a PSW or an OC4 Interrupt. Amazon PLAINLY sees that eBay doesnt want collectable sellers, antique dealers etc anymore and they are MORE THEN HAPPY to help take that money from them. First Amazon came for the small seller and poached them off eBay. Amazon offers easier posting abilities, FBA, no VERO issues, no "MISTRUST & UNSAFE Depts", and constantly emails you trying to help you make sales. eBay does the exact opposite - they go out of thier way to hurt you - over and over again. Amazon emails you about your price, about available hot items that have little to no competition, emails about how to fix your listings to make things sell better ....eBay MC999's you for something stupid. eBay - take note - its the last warning shot you will probably get - Amazon is hungry for more business, Amazon has the resources to succeed, Amazon respects thier sellers, and Amazon is willing to continually try to improve thier game - all things YOU (eBay) are NOT willing to do. Ignore this trend at your own peril! Why waste time with amazon, ETSY and RUBY lane are the best places to buy/sell collectables. Amazon + Google = another eBay screw up ??????? eBay whos never happy, satisfied - but who always is a hungry mofo who wants to take more from each seller has missed ANOTHER opportunity. To make it easier to list on Amazon (these arent used collectables though) ....Amazon now allows you to upload your Google listings as is (as apposed to using Amazons spreadsheet) to get your listings on Amazon for sale. Its only relevant here, because it again proves the same point that I think ALL of us having been saying for ages - eBay works to make your life harder, Amazon at least tries to make it easier. Sellers who advertise products on Google Shopping in certain categories can now upload files in the format they use for Google Shopping to list products for sale on Amazon.com.